← What To Eat for Christmas Dinner – in plenty of time for next year. Sigh. There are people who expect biscuits alongside their dinner and then there is everyone else. We were not biscuit eaters growing up. We were popover people. We also had a thing for Yorkshire pudding. There are good reasons to love popovers. You don’t need to worry about over-handling the dough (as with biscuits) or about yeast and timing as you might with dinner rolls. Popovers are so easy to throw together, as well as being rather elegant – why branch out? In comparison, I always imagined biscuits to be a little doughy and there is a mythology about what type of flour to use and dough handling that seems somewhat opaque. (I must confess that my only real biscuit eating experience came from sporadic visits to Kentucky Fried Chicken – perhaps not the ideal place to form an opinion.) Also, culturally, they belong in the south and we are decidedly not southern. Regularly making biscuits here in Seattle would make about as much sense as nicknaming your son Bubba. Aren’t biscuits a regional speciality? Something to dabble with when serving ham or catfish? We served ham with scalloped potatoes. Biscuits were never a consideration. And then my friend Alicia sent me that book I told you about, Screen Doors and Sweet Tea, and all my carefully formed opinions (some might say biases) went flying out the window. 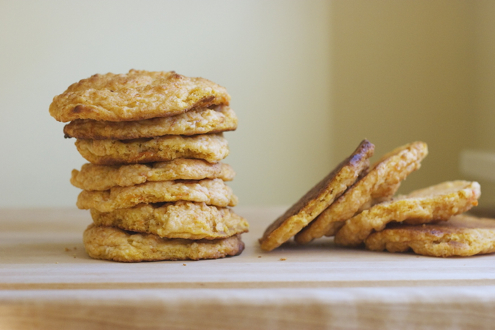 I’m still not sure what inspired me to make Sweet Potato Biscuits. We don’t even eat sweet potatoes that often so it wasn’t like I had a lonely sweet potato sitting on the counter. Perhaps it was the photograph. Anyway, since last week I have made the Sweet Potato Biscuits four times! Actually, since I doubled the recipe three of those times, it might mean that I have made them seven times this week! It was not a week without troubles. While the dough was gorgeous, flecked deep orange and webbed with airy bubbles, the biscuits did not always rise as high as I hoped they would, although the first batch was reasonable. That batch rose to a height of about 3/4 of an inch. Still, I felt they could be better. The next try, the biscuits turned out distinctly and disappointingly flat. See below. Ridiculously flat. They were edible - but only just. I wondered if it was because at Trader Joe’s the yams were masquerading as sweet potatoes. (I knew from the beginning they were really yams but had forged ahead anyway) Or, was it because I simply don’t have the mythic Southern touch?! I went out and bought a real pale fleshed sweet potato and this time they were about 3/4 of an inch again, but still no better than the first batch I made originally with yams. However, despite all my troubles with flat or flat-ish biscuits, I couldn’t walk away. Sweetly tender, enriched by the vivid starchy mash, these biscuits had such possibilities! If I could get them to rise just a little higher, the sky would be the limit, so to speak. Imagine adding a little crumbled bacon, or fried sage leaves? What about some chopped chili? Could there be a place for andouille sausage? Fried crisp and crumbled into the dough? How about a little candied ginger?…but that would have to wait. First I would have to find the right recipe. I found recipes by Paula Deen and Southern Cooking (obviously), and Martha Stewart, but finally settled on one from Chow.com. All the recipes looked excellent and from them I gleaned that everyone has trouble getting Sweet Potato Biscuits to rise as high as the plain kind. Some added baking soda in addition to the baking powder. Some used buttermilk. Most added more flour than called for in my original recipe. Many advised to make roll out biscuits as opposed to the drop kind, opining that if they were packed a little closer together they would lift and stabilize each other. The discussion sounded so Southern. Because there was a cup of leftover mashed sweet potato in my refrigerator from the last experiment, I got started right away. Imagine making a tiny version with chutney and sharp white cheddar to go with cocktails…. Preheat the oven to 400°F with the rack set in the middle of the oven. Using a large mixing bowl, whisk together all the dry ingredients. In a medium sized bowl, whisk the buttermilk and sweet potato together until smooth. Using the largest holes in a box grater, grate the frozen butter. Toss with dry ingredients until butter is evenly dispersed through the flour. Pour in the buttermilk and sweet potatoes. Mix lightly until dough forms a shaggy mass. Flour the counter and turn out the dough. Knead gently – for about 30 seconds, – just until the dough hangs together. It will still be sort of shaggy. Pat into a circle with floured hands to a thickness of about 3/4 inch. Using a biscuit cutter or a drinking glass, cut the dough into rounds. Push the scraps together again and cut out the rest. Discard the rest of the dough as too much handling makes for tough biscuits. Put a piece of parchment on a baking sheet. Place the biscuits on top and brush them with heavy cream. Bake until golden brown, about 12 to 15 minutes. 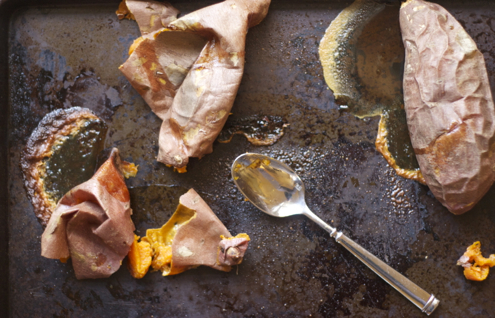 To roast a sweet potato or yam for use in this recipe, set the oven to 375. Place either one large or two medium sweet potatoes on a baking sheet and roast for 40 minutes or so – until very soft. Cool, mash, and get started. For more on traditional biscuit making see this article. This entry was posted in easy, Fast, Uncategorized and tagged easy, fast, side. Bookmark the permalink. I was there, I ate the biscuits! They were amazing!!!!!! While Sarah gave me the recipe for the “failed” biscuits that I was planning on making tonight to go with my soup and Caesar salad (why not? ), I too have scrapped the old recipe and am embarking on new culinary territory – they are in the oven now……..however, I confess, I only had yams. They smell YUMMY!!!! Wait a second! I only found that final recipe yesterday! I was actually pretty happy with the first one too, and may go back to it in the future. Using a little less flour makes for a very flavorful biscuit. As for yams versus sweet potatoes, I think yams give the better color and they perform the same as sweet potatoes so in the end – use what you have! You have to let me know how they turn out btw!